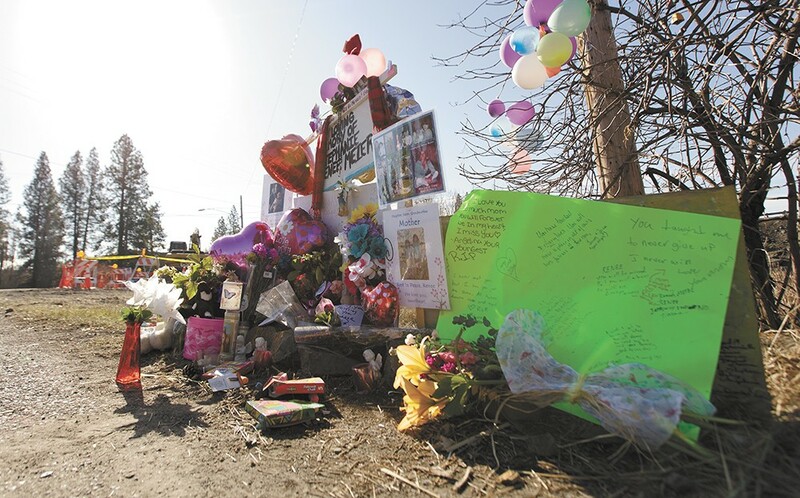 Sidewalk chalk, porcelain angels and stuffed animals — a few Stephanie Renee Meier's favorite things — are placed among flowers and notes left at the accident site. Stephanie Renee Meier slept in that day. Every morning as Alissa Taylor drove past on her way to work at about 6:45, she would check on Meier. She, like almost everyone, knew her as Renee. For years, Taylor had seen her camped around the field at the intersection of Geiger Boulevard and Lewis Street. Most days, 53-year-old Meier would already be up when Taylor passed by. "I usually look over at her, and she's getting up and she's starting to wind her pack up and put her stuff together," Taylor says. But on that Tuesday morning of March 3, Taylor drove past and saw Meier still tucked away in her bright-blue sleeping bag, under the lamppost on the side of a private driveway, in a sidewalk chalk circle she drew labeled "Virtue." A tiny notebook was found in the field where Meier slept. Inside: heartbreaking messages. So when the city worker, working on a nearby groundwater maintenance project, accidentally drove his big white truck over her belongings that morning, she was still sleeping among them. Meier was rushed to Sacred Heart Medical Center, but it was too late. Her death left her husband, five sisters, eight children and her parents grappling not just with this tragedy, but the many tragedies she suffered previously. On Friday morning, three of Meier's sisters, two of her kids, and her husband of 28 years gather in the library of the Women's Hearth. "After 28 years, this is what you're left with," says husband Daniel Meier. "A truck running over your wife." There are the tears and anger and guilt, the exhaustion of funeral preparation. And there's the struggle to understand all the contradictions between who Stephanie Renee Meier had been and who she'd become. There was Meier the outdoor adventurer, who as a child built forts with her sisters out of downed trees and trash bags, who took her kids to the river, who fearlessly jumped off a 40-foot cliff into glacial water. There was Meier the teen athlete, the best skier on the Spokane Mountaineer Racing Team, who spent two months skiing with only one ski and still beat the boys. There was Meier the artist, who painted Led Zeppelin album art in her room, who gave her little sister Amy a painting of an angel in an elaborate winged frame. But then there was the Meier who suffered deeply. "When I was in high school, Renee was dropped on our front yard. Beat. Broken bone in her face and fractures. 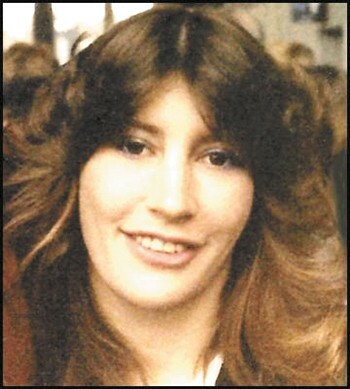 And she would not say who did it," her sister Denise says, voice breaking. "She was inebriated. I'll never be able to smell alcohol on a person without just having [flashbacks]." In the last five years of her life, Meier was hit by homelessness, assault and mental illness. She was strong and creative, but also deeply hurt, angry and broken. Daniel Meier thinks he knows when his wife began to change: August of 2007. That's when Child Protective Services came to take their kids away. The cops handcuffed Daniel on the back porch and chased down the kids who ran and hid. "It freaked Renee out," he recalls. "She was crying hysterically." Daniel wasn't perfect — he's served serious prison time — but in this case, CPS was in the wrong. Three months later, they returned Meier's kids to their parents, apologized and admitted their action was unfounded. But the trauma had left its mark on Meier. "That happening, that was it," Daniel says. "From then on, she just got worse and worse. That's when she went downhill." The old Meier baked Christmas cookies and elaborate birthday cakes. She practiced karate. She'd studied architecture, graduating with an associate's degree from Spokane Community College. She was quiet, kind and sweet. But the new Meier would get spitting mad, sometimes screaming within inches of her family's faces, jabbing her finger against their foreheads. "Her whole self changed," Daniel says. "She would smash stuff I collected. She'd push me around." Her family still wonders what she suffered from: Bipolar affective disorder? Schizophrenia? PTSD? Drugs? Whatever it was, they knew something was wrong. She'd tear apart their stereos and TVs, terrified she was being watched. She'd rattle off rapid monologues about aliens and clones and water company conspiracies. She'd collect magnets and magnifying glasses, hoping to ward away bad energies. Her family members called Spokane Mental Health again and again, but without Meier's cooperation, there was little they could do to get her treatment. It made it hard for her to find a place to stay. In 2009, Daniel says, he paid for an apartment for Meier in the Geiger area of West Spokane, but she was kicked out after three months. That's when she found the nearby field. It was the former site of the Skyline Motel, where a cellphone tower and a solitary evergreen tree rise up from three acres of brush, rock and dirt. It was where she spent much of the past six years. It was where she died last week. "She didn't like being there alone," Daniel says. "I feel like she wanted me to come out in the woods with her." But he couldn't. He was too old, had too many surgeries. He'd lost a leg in an accident — it just wasn't feasible. This was the struggle her family faced: How much should they give to help Meier? How much could they? Amy Bender, her sister, cries as she stands in the field. "I would drive away and cry and feel guilty for being warm, and feel guilty for leaving here," Bender says. "And then every night, we'd have to worry, is this the night she's going to die?" It's not quite right to say that Meier would never ask for help. She sought aid from House of Charity and Union Gospel Mission. She sometimes stayed the Hope House women's shelter, and visited the Women's Hearth frequently. The women there knew her best by her artwork. "She says, like, 'Does this look alright?'" remembers Tammy Smith, a Women's Hearth patron. "I said, 'Yes, it does. It looks beautiful.'" To her friends and family, her art seemed like a compulsion, a form of therapy and an outlet of self-expression. Ultimately, it's a legacy. She drew everywhere. In January, she was arrested after breaking into the Spokane House Hotel and covering the windows with artwork. On a chair slipcover, she drew a landscape with waterfalls and bridges. She sketched a bearded man and a woman on the hood of a blue-and-white jacket. Her sketches of figures remain on the window at Women's Hearth. Her drawing of the city of Spokane on a pillowcase is framed at the Hope House. Eighteen-year-old Haley Meier's long, wavy blonde hair hangs free as she stares down at the big drawing pad in front of her. She's an artist too, though Haley's lines are clearer and sharper than her mother's. Haley has sketched a picture of herself sitting on a park bench, Meier looking down from heaven with a halo. Last January, Haley and her boyfriend packed up a tent and sleeping bags and tarps and some food and for more than a week, slept in the snow and the freezing outdoor air with Meier. "I just wanted to be with my mom," Haley mumbles. "I love my mom. I'd tell her I would do anything for her." In the spot where the truck crushed Meier, there's a memorial stuffed with flowers and photographs, stuffed animals, angel figurines and sidewalk chalk. Today, the adjacent rock face has been painted with the word "VIRTUE," in the vibrant pink-and-purple palette of Meier. The word "Mom" is scrawled on a nearby rock in pink. At the memorial, Meier's mom, Jacqueline Bender, holds up a piece of her artwork, cardboard completely covered in hot pink and purple Bible verse fragments. There were times when Jacqueline feared her daughter. Five years ago, she pleaded with the court to implement a no-contact order. "For the past several months, I have been afraid of a violent family confrontation," Jacqueline wrote. "This has been escalating for years." But that fear ultimately didn't stop Jacqueline from coming to her daughter's aid. The night before Meier's death, her clothes had been tossed around, soaked with snow — and she called her mother for help. For four hours that night, Jacqueline drove her daughter around. "I went to Walmart and bought her shoes and socks and a hat," Jacqueline says. "I bought her a bus pass." At around midnight, she asked her mom to take her back to the field. "I said I'd get her a hotel room, and she said no," Jacqueline says. "I said, 'Renee, it's midnight, I'm tired, I'm old.' And she said, 'I'm just going to stay here.'" She knew she couldn't argue with her daughter. She learned that Meier had died the next morning, she says, when she read about it in the newspaper. The afternoon after her sister's death, Amy Bender wandered the field, searching for clues to make sense of tragedy. She stumbled across the remnants of her sister's collection scattered throughout the brush and stone — broken circuit boards, a suitcase, playing cards, sidewalk chalk. And there, tossed on top of a rock face overlooking the scene of the accident, she found a tiny notebook, a brilliantly colored bird on the cover. Inside, her sister's handwriting covered the periwinkle-blue pages: "Love your children. Bless them with your time." Meier didn't know she was going to die, but there, impossibly, are her last words: Love notes in pink pen to her children. "Haley: I'm so sorry I got hurt and wasn't there." "Stephen: I love you. You are very creative." "Angelina: May you be appreciated. I love you."